The Cyclopes come from the earliest days of Greek mythology. Said to be sons of either Gaia and the titan Uranus or the sea god Poseidon and the sea nymph Thoosa, they were giant, one-eyed, galumphing, man-eating creatures who roamed the land spreading chaos. They clomped around the place with nary a thought for anything but themselves. They weren’t the sort of people you’d invite round for afternoon tea – they’d prefer to eat the hostess and leave the Devonshire tea untouched. Three Cyclopes – Arges, Steropes and Brontes – apparently had discipline enough to work as blacksmiths; they certainly had the strength and stamina to labour over a hot forge where they fashioned all kinds of weapons of war. According to the ancient poet Hesiod, their own father Uranus was frightened they would overthrow him and had them imprisoned in the hellish abyss known as Tartarus. Clearly his parenting skills were lacking, and this was a “go to your room” directive of an extreme kind. Later the god Zeus freed these three Cyclopes so they could whip him up some thunderbolts in order to overwhelm the Titans and allow the gods to become the dominant race. They also created some other famous godly accoutrements like Poseidon’s trident and the bows and arrows used by brother and sister Apollo and Artemis. No one had to kill these Cyclopes because it seems they were now earning their keep. 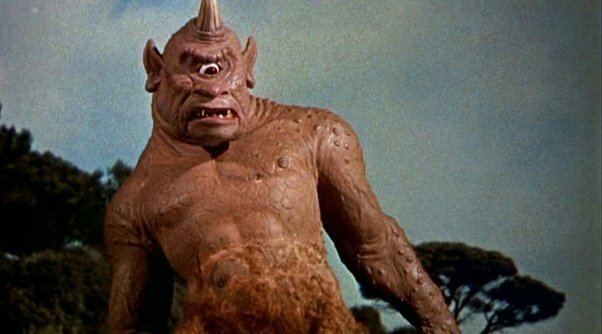 By far the most famous of the Cyclopes in Greek mythology was Polyphemus, an especially barbarous example of his race, whose reign of terror came to an end when he was outwitted by the hero Odysseus (aka Ulysses). According to Homer’s Odyssey, on his way home from the 10-year siege of Troy, Odysseus and his men stopped at the island (thought to be modern-day Sicily) where the Cyclops Polyphemus had made his home. When they found a cave full of food they were thrilled because their provisions had run out, so like many another wandering warrior, they decided to take this bounty for themselves. Unluckily for them and as you’d expect in a good story, the cave belonged to Polyphemus who was rather annoyed at the presumptuousness of these squatters. First, he grabbed a couple of the sailors as an appetiser, scoffing them down before they even had a chance to scream. Then he rolled a rock across the cave entrance trapping the rest of them inside. Actually, he always rolled a rock across the entrance because at night-time he kept his sheep inside the cave as well. Uh-oh, thought Odysseus, my men survived an epic war only to be gobbled up by a Cyclops. This won’t look good on my resumé. I need to come up with a cunning plan. Looking around, he saw there was plenty of wine in the cave, so he resolved to get Polyphemus drunk, which as it turned out, didn’t take all that long. When the Cyclops passed out, Odysseus took a massive wooden stake and plunged it deep into the single eye of the Cyclops, blinding him. Now, some accounts say that this attack killed the Cyclops instantly, so there’s your slaying; but there’s a better story if we just stick with the him-being-blinded scenario. So there’s Polyphemus roaring with pain having had his only eye jabbed out. He couldn’t see but Odysseus and his men were still trapped inside the cave and had to figure out how to get out without being grabbed and devoured. Luckily our man Odysseus was a lateral thinker. He directed his men to tie themselves underneath the sheep so when Polyphemus let them out to graze, they could escape without being detected. The warriors raced back to their ship and would have been safely on their way. But hubris is a big deal in Greek tradition and Odysseus had more than his fair share of it. He couldn’t resist telling Polyphemus his name, show-off that he was. Poor old blinded Polyphemus remained on his lonely island tending his sheep. But he had his revenge – when he learned the name of his tormentor, he called upon his father Poseidon to further delay the hero’s return home. It took Odysseus 10 years to get back to Ithaca and his family. All in all, it’s your classic lose-lose situation.